This piece of mediumwave listening is written from the point of view of Nordic countries. I hope that this introduction provides useful information and ideas that benefits a listener regardless of location. In Finland, Sweden and Norway there is a long time tradition of mediumwave DX. There is no continent and hardly no country active on MW that has not been heard in these countries. Even long after the 1970s-1980s haydays of DX hobby we still have probably hundreds of more or less active MW listeners, or AM DXers, if you prefer that name. Meanwhile radio amateur listening (SWL) scene is very modest. In Finland number of active organised SWLers who are not radio amateurs is somewhere around 10-20 persons. While browsing various clubs and activities in Facebook and otherwhere it's been a big surprise to a Finnish Dxer to understand how popular SWL is elsewhere in Europe (people really do it! ), and how practically nonexistent is MW DX and thus knowledge of this area is often lacking. There are several rational reasons to this difference in radio culture, and the environment is not the least of them. Obviously, cramped urban space with multiple cheap Chinese electric junk radiating interfering RF noise on MW band is poison for MW DX as this low frequency broadcast band suffers the most. Even in Finland the level of man made noise has exploded through the roof during recent decades. Practical solution - and only real solution - is to set up a listening post on countryside, directed remotedly via internet or manually in location. Many boundaries can be crossed this way. For instance, somebody in Northern Ireland might listen to Marshall Islands in Finland, and a guy in Belgium might listen to Japan in Norway. clip: 1570 CHUB Nanaimo BC, Canada, 30 Dec 1986. In MW listening antenna is everything. Do you think a new receiver might make the difference? If you recently brought your 20th receiver to your shack and you connect it to the same poor antenna or no external antenna at all, and you wonder why there is no improvement - well, that's not surprising. If you are a radio collector, that's fine. However, if you wish to catch new stations and you are using 2 metres long wire on window as an antenna, you could as well buy a cheap Chinese one circuit receiver instead of spending big money to JRC NRD 545, because you will have exactly the same results. In fact, a Chinese receiver might perform even better, since there is in-built ferrite antenna and NRD has no antenna at all inside it. Such antennas as loops, that can be practical in nulling interference, have traditionally been 2nd tier antennas in Finland. We are located far away from mostly everything, so signal levels from loop are miserable. In heavily urban Central Europe, where several strong stations are nearby and target stations are all around, situation is completely different. It is possible to turn loop until it points sharply to the wanted station on the dial and separates it from others. Move the listener 2000 km away and now you cannot separate British stations with a loop as all those signals arrive from the same direction. In Nordic countries our own MW stations have always been scarce and today MW band has almost none local transmitters. Again, in Central Europe this has never been the case. During the cold war there was a ridiculous transmitter power arms race going on MW with megawatt stations on all sides. That was certainly very discouraging for listeners wishing to catch rare distant stations on MW. It was a real nuisance on Northern latitudes too. Richard Wood reported that in those years 1200 kW NRK station in Kvitsoy was a most common European catch in his home - in Hawaii. This awful situation was best illustrated by what the manufacturers did with their radios. In 1980s and 1990s communications receivers sold in Europe had purposedly attenuated MW band to prevent image frequencies and ghost stations appearing in heavy signal field. When those receivers arrived in Finland the first thing Dxers here had to do was to open the radio and dismantle attenuation by cutting or soldering some wires. Also hobbyists routinely installed new, narrower high class Murata filters in receivers until they were accepted as DX tools. Every receiver design is a compromise between dynamic and sensitivity, features and price, and unfortunately every modification ruins that fine balance the engineers had in their minds. But what to do. Designs and solutions that are passable for most shortwave radio amateurs are not ideal for MW DX purposes. In tests we have found that a popular Wellbrook loop that is almost unanimously praised in hobby reviews, loses even to a tiny 60 meters long random wire. If a listener really has nothing else but his balcony, in that case a loop or miniwhip is the solution. In any other cases please do yourself a favour and use a wire antenna. In places like Netherlands that is the most densely habitated country in Europe, even 40 metres wire is called a long wire. In Finland it would be a tiny stump. Maybe good for SW, but on MW it really is lacking almost everything we wish. Our long wires begin somewhere around 200-300 metres and we call that more like a good start than a real long wire. A real long wire is at least 400 metres long all the way up to 1000 metres. That is one kilometer. I am completely aware that this is a distant dream for most people in developed world. It is not always possible in Nordic countries either. If you can erect a 200 metres long wire, be happy with that. Certainly it is not an antenna solution for your balcony. There is no theoretical upper limit to the length of antenna, but in real life 1000 metres is the point where maintaining wire and keeping it in operating condition becomes bigger issue than the possible fraction of gain one might possibly achieve with yet another extra 100 or 200 metres of wire. On the other hand, you can walk a lot and you will be physically in a great shape. DX - a healthy hobby! Naturally all the hazards are on the responsibility of listener, not a landowner or anybody else. The height of antenna must be at least 3 metres at every point of wire as winds and storms shake trees and meese jog criss cross around forest. For some reason berrypickers and mushroom hunters don't like to be hanged by a copper wire either. Even more dangerous would be if somebody decides to skicross with motor sledge under a low hanging wire. Crossing country roads is an art form itself. Generally that is simply a no-go zone. A wire crossing a road at 6-8 metres height can stay intact for years after years, but it requires solid structures on both sides of road and good understanding about the local traffic and weather conditions. A much better idea might be to build coax feed through a rainwater tube under the road and begin antenna on the other side. Constant trouble to Finnish listeners are lumberjacks harvesting in the woods. Slim wires are not a match to forest machinery and falling trees cut easily any wire to smithereens. There is a never ceasing discussion about the wire material. It is claimed that plastic coated wire collects more static than an enameled copper wire. I haven't noticed that. I would be much more worried about the durability of wire. 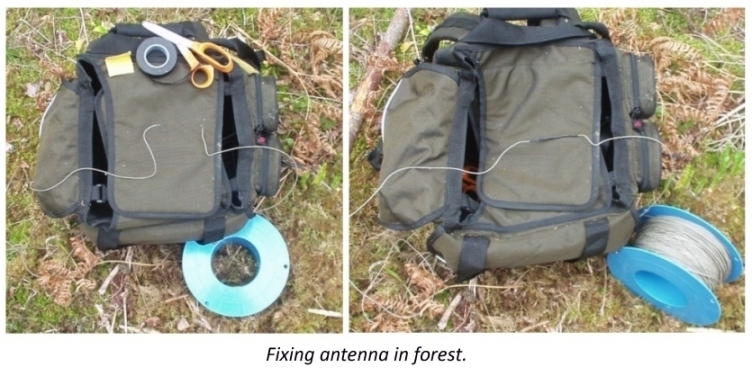 It is possible to make almost invisible stealth antenna with very slim copper wire, as long as you remember that it will be cut sooner or later by falling branches, waving trees, or unaware animals and humans. A jigsaw wire or collected works, made of many short pieces is another risky choice. Sometimes one cannot avoid that. Soldering a joint to antenna wire is a bad way to fix an antenna because solder is inflexible and corrupts in freeze. All you have created is a natural breaking point where the wire certainly breaks down next time. Use lightly sandpaper and rub away the enamel coating of wire and then twist the ends together tightly by hand. Coat the joint with vulcanic rubber tape. If we would care only about the metal conductivity, our first choice would be silver. Copper is almost as conductive but much cheaper and softer, and that's why it is the generally used in electronics. 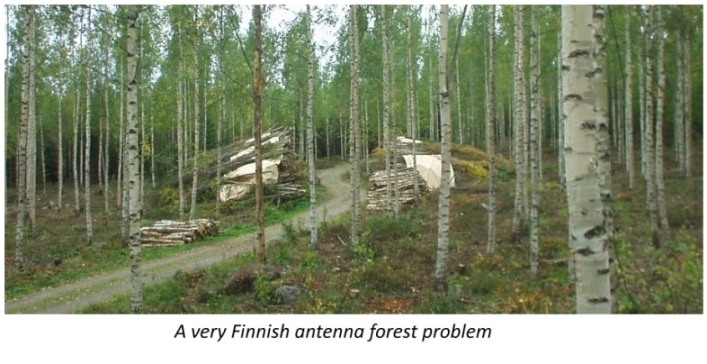 In Finland a popular choice for permanent antenna has been killu, extremely durable copper coated steel wire that was used for decades as telephone cable, but it is heavy stuff to erect and carry. New kevlar coated wire materials are both durable and lighter, which means less strain and weight to branches. One could imagine they fight better against gravity. Thickness of antenna material is not generally meaningful to us. The thicker the radiator, the wider the frequency area of resonance. But on mediumwaves our antennas will never be in resonance, so forget it. By the way, gold is not as conductive as copper, and we know how expensive it can be. Gold is used in electronic contacts because it doesn't corrode. A millionaire would not listen better with a golden antenna. A long wire is a bi-directional antenna. It receives best from the directions where wire begins and ends. In real life wire is never straight, because trees don't grow in geometrically straight line between your listening post and Boston, but in all practical solutions a little wobbling in margin between -5...+5 degrees doesn't matter. We suppose that will happen even in the best case. Such antenna that points to 300 degrees ie. Boston, will also point backbeam to 300-180 = 120 degrees, where we find Arab countries, Iran, and Western India. Powerful stations in Arabic world and Iran transmit 24 hours a day, which means automatically that those stations do appear and disturb attempts to receive North American stations in night time. Splatters from next channel make life difficult even though American station would be on 780 and Euros and Arabic on 774 and 783. Even more difficult would be listening to Japan in late evening, while Japan arrives from 45 degrees and from 225 degrees blasts Spain, on same European-Asian 9 kHz channels. If you are interested in both areas, that's the antenna for you. These compass directions apply to Finland. Directions at your location can be very different. 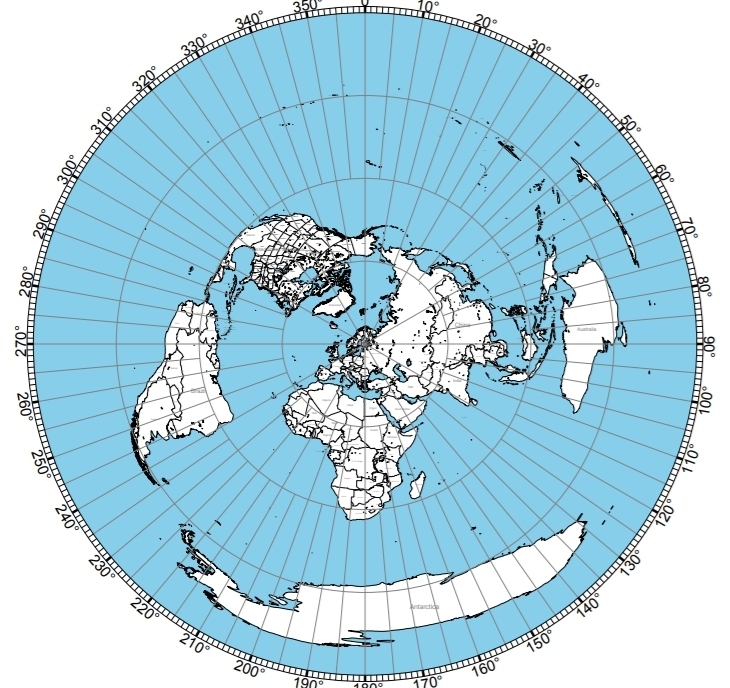 You need a great circle map to find your place on earth, and a good one can be generated for example on site https://ns6t.net/azimuth/azimuth.html. There is no way to make miracles and make Iran or Spain (or whatever your local pest might be) totally disappear during night. A single wire antenna is not capable to do that. However, we can do our best to make sure that backbeam has minimal gain. We can add a mass or metal resistor in the end of the wire and ground it. The better the grounding the better this antenna works. The result is a boosted front/back ratio that often is the missing piece that makes difficult reception possible. This antenna was invented by engineer Harold Beverage in 1921 and it is still called after him a beverage antenna. Even a short beverage is a beverage. A short random wire of 60 metres might open brand new horizons if it is made into beverage antenna. Ideally the value of resistor is equal to the impedance of long wire antenna. In lengths of 400-1000 metres the practical all-purpose value is 470 ohms. Everything in real life environment affects the antenna impedance but 470 is a good place to start. A hifist solution would be to use 1 kOhm potentiometer and tune it to ideal position with the help of other guy with a cellphone at the receiver. Naturally these terminating resistors should be covered against the weather. It wouldn't be a bad idea to try to include a lightning strike protection with a zener diode or other surge protector, or use several resistors in paraller to increase the power handling capacity. Cheramic power resistors are needlessly expensive for terminating purpose and there are only handful of values to choose and those values are typically not what we are looking for anyway. Sometimes it is asked should beverage wire begin or end diagonally or in certain angle. The most illustrations one can see around in literature and web are more like illustrations of principle than real schemas for antenna builder. For all practical purposes antenna can very well begin in 30 or 45 or 60 degrees rising angle and end in the same way. Ideally there should be no loops of any kind in wire but how are you going to attach it to trees in the end of wire if you are not allowed to wind a spiral around branches or trunk? I think some improvisation is unavoidable in natural environment. Sometimes it is suggested that a poor ground with rocks and clay soil can be improved even by adding a small pack of salt into the grounding hole to improve conductivity, but spoiling the soil is a move that must be taken cautiously unless we are talking about total wasteland. A good grounding makes local noise level lower and helps tiny signals popping up on dial. 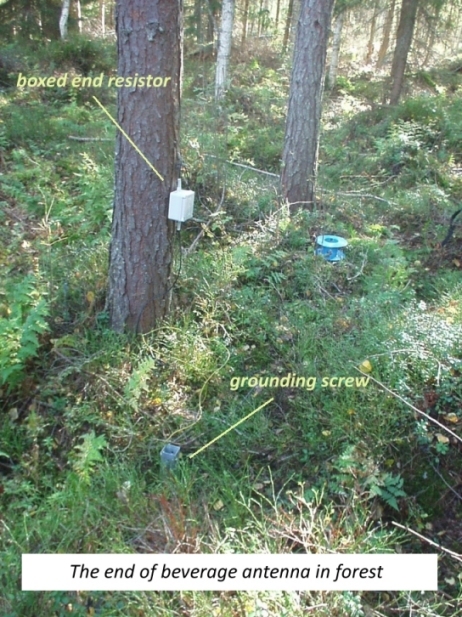 Therefore there should be a grounding system also around QTH, like a small muddy dike where you can bury some 10-20 metres of copper wire or more, if you can. Or even a grounding loop around the house, if possible. Or moisty soil where you can dig in big aluminium screws. Those screws are sold at construction stores for very cheap price. This grounding is connected to the impedance transformer box that transforms antenna's 450 ohm impedance into 50 ohm impedance. If you use a traditional communications receiver, you can skip this phase and connect antenna and ground directly to the receiver. There is a high-Z input for that purpose, that wire lock or screw on the back of radio. In ye olden times that was all we knew. Then arrived SDR radios that really require 50 ohm coax feed and I was very puzzled. 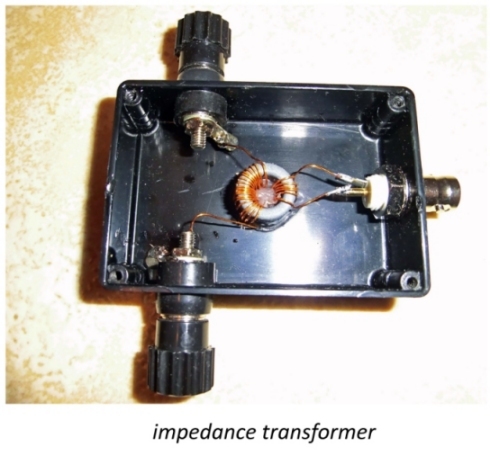 Impedance transformer is a simple device that has a single toroid in it, something like 3-4 windings on receiver side and 9-12 windings on antenna side. We have experimented with various number of windings and we have found out that the exact ratio is not so critical as one would suppose. In any case nothing can stop you experimenting with several transformer designs and choosing the one that matches best the impedance of one particular antenna. What matters most is the material of toroid ring, and here one needs to consult manufacturer's data sheets. All toroid materials are not resonant on mediumwave frequencies at all and were never purposed to be. 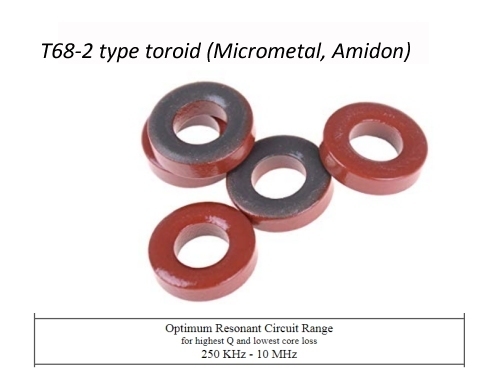 Dark grey ferrite toroid FT50-J or red/black metal mix toroid T68-2 do work on MW band for example. Use original Amidon or Micrometal, because then you know what you do get. Chinese made imitation toroids are cheaper but they are not certified. Most of antenna literature is for amateur purposes and only partially useful for MW Dxer. For example, a lot of antenna literature concentrates in optimizing the wavelength (of transmitter antenna) for perfect resonance. How can we have a perfect resonance on MW band where the wavelength in lower end is around 550 metres and upper end around 180 metres? Simple. We cannot. Amateurs have it easy, damnit! Here amateur literature - that concentrates heavily in transmitter antennas - typically tend to say that a badly resonant antenna is useless rubbish under any circumstances and kill it with fire and let the hounds of Hades eat it, which is a curiously wrong idea. Any piece of copper works as receiver antenna. Some pieces of copper just do it better. In the case of hundreds of metres of wire we can simply forget the whole idea of resonance and believe it is that huge antenna gain that makes it. Usually it does. After that amateur literature talks about antenna matching unit amplifiers with excellent Q values for as narrow optimized working area as possible. This device is called antenna tuner (no amplifier) or antenna preselector (with amplifier), and it was a fine solution as long as we listened to one particular frequency in one time with a communications receiver. Preselectors were regularly used in MW Dxing for decades until SDR receivers entered on stage. Ideally preselectors amplified exactly the wanted frequency and almost nothing else, which meant that they were kind of interference blocking devices in the same time. Sadly, as useful as preselector used to be, today it is an obsolete solution for a MW Dxer, who wishes to listen and record the whole broadcast band in its entirety from 530 kHz to 1700 kHz with SDR and hopes that each frequency on scale would have same ideal reception. This is exactly how a preselector does not work. That's why it was called selector. There is one peripheral device that can be suggested for modern day MW DX with SDR: a low-noise broadband amplifier for daytime listening. (Strength of night time signals are never a problem.) During Dxpeditions in Lapland signal strengths are typically minuscule. There have been cases where listeners have used even three broadband amplifiers in series to dig up the tiniest microvolt from antenna. Needless to say, in this kind of heavy-duty use these low-noise amplifiers indeed must be low-noise in reality, not just in advertisement text. Otherwise we are just amplifying background noise. There are numerous models and kits available and an accustomed maker creates his own rather easily. Another interesting question is how would MW beverage behave on SW? The short answer is: brilliantly! In demanding radio amateur work beverages are in constant use by operators. A 650 metres long beverage 3 metres above the ground produces this kind of antenna pattern on 20 metres. The reception angle is as low as one could ever wish for, meaning that the most distant signals arrive with best gain. Also dominant direction shows very clearly. However, this doesn't mean that antenna wouldn't receive also from other directions. There are numerous small lobes reaching all the other possible directions and distances, but it is certain where this antenna works best. By the way, beverage is a hopelessly poor transmitter antenna and if one inputs a hundred watts into it, the result will be a destroyed impedance transformer and terminating resistor. End-fed transmitting antennas require different, more robust solutions than what is told here. Mildly interesting fact might be that beverage is a vertically polarised antenna, even though it goes horizontally hundreds and hundreds of metres. When we have built an antenna farm, it is preferable that every antenna doesn't begin at the same point. There should be some space between them. 10-20 metres distance should suffice. A big signal source close to other big signal source affect each other and antenna patterns will not be what we planned. Crossing antenna wire above or under another antenna wire is exactly what we don't want. Bulding antenna wire under power line is strictly forbidden under every circumstances. An absolutely perfect antenna probably doesn't exist. But we can keep trying to find it. Now we have a QTH, we have an antenna with impedance transformer, we have a grounding, we have a receiver, and we cannot hear a damn thing. Welcome to the wild world of radio conditions! clip: 1460 KULA Honolulu HI, Hawaii, 23 Dec 1995. You have probably heard how sunspots have 11 years long cycles. The more sunspots the higher the usable frequency generally is. Shortwave listeners would love to have high sunspot number to have more life in 10 metres area for example. Mediumwave listener wants exactly the opposite, sunspot minimum, that makes possible to receive those elusive Pacific islands. That's not all. Occasional disturbances generated by our hot and burping sun occur all the time regardless of sunspot phase. If anything, it seems that sunspot minimum is geomagnetically more turbulent than sunspot maximum. Solar eruptions burst out all kind of particles that solar wind carries to earth and they concentrate to earth's magnetic poles. This sounds familiar. It is exactly how Northern Lights are born. During a peaceful calm period MW conditions improve and improve, until finally solar eruption ends the party. Comparing Kyoto DST index and radio observations proves us that the best enhanced conditions happen right before the effects of solar eruption reach the planet. Like a sea that draws back before a tsunami. Let's imagine that signal paths are a slowly opening fan, or peacock tail. In the beginning we have only one path, north to south, exactly according to lines of earth's magnetic field. When conditions are improving, the fan opens and widens slowly, opening paths to west and east, then northwest and northeast, finally all the way over the North Pole. As we all know, after North Pole there is only one way to go and that is down. Sooner or later comes solar disturbance and a new round begins. I have a strictly unscientific theory about this: might it be that in solar eruption the lightest particles, electrons, arrive first, enhancing earth's electric field, increasing conductivity, until heavier particles like protons and neutrons arrive and turn the direction of conditions drastically. In every case, it's been known a long time that especially protons are able to cut all mediumwave paths from Europe to America and Far East. When that happens, the dxpeditionists in Lapland switch off their receivers and go fishing, or to buy beer from Norway. They are trapped inside aurora zone and no signal comes in from outside. Proton flux is observed in real time in space weather stations all over the world as those proton eruptions cut and harm satellite communication. A 'new' trouble in our area of interest is a coronal hole. Naturally those have existed always, but we Dxers have been blissfully unaware of them until internet brought us daily real time reports. Sun's surface is not solid. It is a molten and gassy brew of hellish clouds. 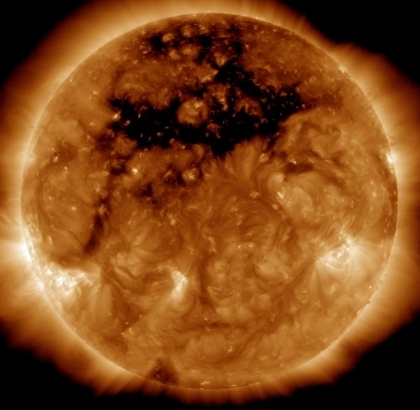 Coronal holes are cracks in clouds, revealing sun's flesh under skin, and opening the way to all kind of eruptions of unwelcome material in the case coronal hole turns to the centre of solar disk and points straight to the earth. Some coronal hole effects pass the earth like nothing happens when their polarization is equal to earth. If polarization is opposite, they can ruin conditions for weeks. Their behaviour is very unpredictable. We cannot choose the circumstances, but we can get out most of them. There are not really 'bad' conditions, there are just different conditions. During solar disturbance when north-south path is dominating or the only existing one, there are excellent chances to listen to Africa in Europe. South Africans that can not be heard other times, can appear on dial. Likewise in North America, South America is the target. During 'top' conditions, when Kyoto DST is heavily on positive side, Tromso K index has been zero for days, and solar Bz component arrow points upwards, the way opens to Alaskans, Hawaiians, etc. Kyoto DST index - Global disturbance index. Positive numbers are preferable. Tromso K-index - Zero value is preferable. Australian Bz component observations - Green area is preferable. However, our knowledge is lacking. Scientists discover new facts about sun every year. Numerous are the times when all the indices point that we have excellent conditions right now, but you couldn't tell that by tuning around on dial. Some piece is missing. The best conditions indicator is still your receiver.